The name David Gemmell is synonymous with great fantasy, yet I'd never read anything by him before. With over 30 titles to choose from, I thought I'd start at the very beginning, with his debut 1984 novel, Legend, the first book in what eventually turned into an 11-book series called The Drenai Saga. The book hooked me from the start and just kept on improving unto the end... where it ends with a finale that I am just not sure about. Through most of the book, I enjoyed every word -- the wit, the humor, the wealth of great characters quickly and expertly sketched, the effective action. Legend is a fast read; the paperback is a slim 344 pages. It centers around a great heroic warrior named Druss the Legend, who has seen war and battlefield glory for most of his 60 years, survivor of "last stands" and hopeless causes too numerous to list. He wields "Shaga", his battleaxe, and though he has been wounded innumerable times, he has never fallen. Legends of his battlefield exploits are told to children throughout the lands. But he is old, and has retired to the mountains to live the remainder of his life alone. A letter from an old friend changes that. It's time for Druss to see if he has one last battle in him, as the Drenai lands are going to be swallowed up by an enemy a half-million strong, who will roll over the lands once they get past the mountain fortress of Dros Delnoch, the last thing in their way. What? Hey, don't complain that I'm writing a generic, clichéd review! It's very appropriate to the title! I'm having a hard time coming to a firm conclusion about this book. As you can see from the description, the story is fairly clichéd. The desperate, Spartan-like last stand, impossible odds, the aging hero, the gathering of disparate characters from different segments of society, converging on the fortress for their own reasons, to fight and die together. There are magic users, mind readers, future seers, magic weaponry and armor, skilled warrior-types that can fight/kill all day long and get up the next day for more of the same. There is bloodshed. There is the evil ruler who doesn't think he's evil. There are war horns. There are battles in the rain. Walls are scaled, boulders are flung, people are dispatched in every conceivable manner. There is a love story. There is communication with the dead. There are people coming back to life and/or surviving against all odds. What holds me back from being more dismissive of the book are several things. First, this is 1984 when this came out. I don't know how many of these aspects were cliché back then. It could have all been fresh, for all I know. Maybe subsequent authors took their now-clichéd ideas from pioneering books like this. Second, this was a debut novel, so I need to cut the author some slack in any case. Third, and most importantly, the book really is very well written. It was an enjoyable, solid read, and I really do highly recommend it. It would have been easy to stick with the strong central character (in this case, Druss, Captain of the Axe) and let everyone else play supporting roles. But Gemmell peoples his cast with strong characters in their own right, who are so strong, in fact, that they often threaten to overshadow the main character, and are just as fun and interesting to read about as Druss is. All unique, all reluctant warriors making the hopeless last stand against the enemy army because it is the right thing to do, not because they think there's a chance of survival. But my main quibble is the ending. Without spoiling it, let me say that it builds as you'd expect, and then throws several very convenient coincidences at you in rapid succession that completely turns the tide, transforming the tale into something a bit too "feel good" for my tastes. It's not like everyone survives, they don't. It's not like they single-handedly defeat the enemy, they don't. But certain details struck me as a bit too convenient, that's all. Ultimately, I'm ok with it, though. It could very well be that other readers would find the ending to be perfect, so take this with a grain of salt. Summary: 4.25/5 Very well-written and fun to read. Many strong characters. Genre clichés are present in droves, but it didn't matter much to me, since the tale is so well-told. In fact, I admit that there was a particular scene that I read that brought tears to my eyes. 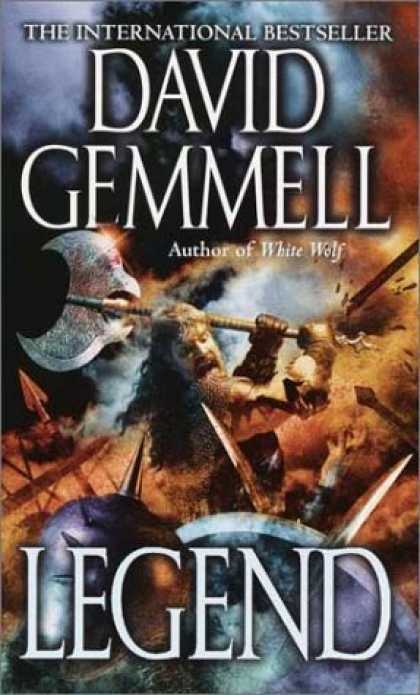 I highly recommend this quick read, especially if you're new to Gemmell, like I am. As an aside, I've been nosing around online about this book/author, and discovered the interesting back story of this novel. In 1976, Gemmell was diagnosed with cancer, and thought he was dying. He wrote The Siege of Dros Delnoch (which became this book) in order to take his mind off of his illness, which he believed would be terminal. He wrote this story in 2 weeks! He was using the story as a metaphor for his illness, with the fortress representing himself, and the invaders representing the cancer. He left the ending open, waiting to see how his own battle would end before determining how the book would end. Turns out he was misdiagnosed, and didn't have cancer after all! He set the script aside until 1980, when a friend read it an encouraged him to finish it and try to get it published. Wild, eh? In any case, apparently Gemmell acknowledged the flaws in the tale, but says it represented a certain point in his life, and that he didn't want to rewrite it, for fear of changing the heart of the story. Anyway, it is still his most popular, best-selling book. No comments today, eh ? Dave, good review! sounds really interesting! I'd love to give it a go! Thanks for the review. Cliche-wise, I think most of our modern-day trite stuff was still relatively fresh back in the late 70s and early 80s. I've not read anything negative about this book, and it is considered by many to be a classic in the fantasy world. I think I'll just have to add it to my TBR pile now. 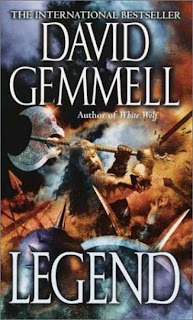 I was fascinated to read your review on David Gemmell's Legend. I've written a novel, first one. It got a review on fantasybookreview.co.uk The reviewer likened it to a David Gemmell novel. I've never read Legend, but most of the things you say about it reflect key elements in my book. I was wondering if I sent you a copy, would review please? Regards, Bob Le Normand, UK. WOW! This is an amazing review. I want to go get this book now. I like all the battle and magic that sounds to be included in this book. I am surprised that this book is only 344 pages. It sounds like a tale that would be told in a longer frame. Thanks, because I had not heard about this author or books before. It does sound as there are cliches in it, but if the writing is that strong it would be worth it. Thanks! Bob: Of course I'd review it! Are you kidding? That would be terrific. You can email me at davidwagner1 (at) cox (dot) net and we can connect. It would be an honor. Dry: If you get that song stuck in my head, so help me...! Abbie: You can borrow it if you'd like! Logan: It definitely deserves a spot in your TBR pile. I'd be curious to see your take on it. Melissa: Thanks for the encouragement! It's a pretty quick read, if you ever see a copy of the book in passing, and you've got nothing else to read (lol).